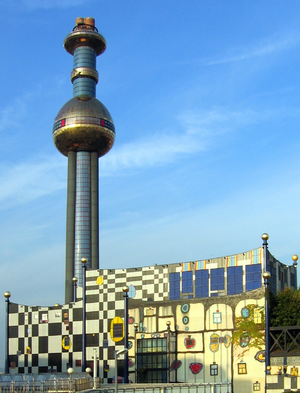 Spittelau incineration plant is one of several plants that provide district heating in Vienna. Waste-to-energy (WtE) or energy-from-waste (EfW) is the process of generating energy in the form of electricity and/or heat from the primary treatment of waste, or the processing of waste into a fuel source. WtE is a form of energy recovery. Most WtE processes generate electricity and/or heat directly through combustion, or produce a combustible fuel commodity, such as methane, methanol, ethanol or synthetic fuels. The first incinerator or "Destructor" was built in Nottingham UK in 1874 by Manlove, Alliott & Co. Ltd. to the design of Alfred Fryer. The first US incinerator was built in 1885 on Governors Island in New York, New York. The first facility in the Czech Republic was built in 1905 in Brno. Incinerators may emit fine particulate, heavy metals, trace dioxin and acid gas, even though these emissions are relatively low from modern incinerators. Other concerns include proper management of residues: toxic fly ash, which must be handled in hazardous waste disposal installation as well as incinerator bottom ash (IBA), which must be reused properly. Critics argue that incinerators destroy valuable resources and they may reduce incentives for recycling. The question, however, is an open one, as European countries which recycle the most (up to 70%) also incinerate to avoid landfilling. Incinerators have electric efficiencies of 14-28%. In order to avoid losing the rest of the energy, it can be used for e.g. district heating (cogeneration). The total efficiencies of cogeneration incinerators are typically higher than 80% (based on the lower heating value of the waste). The method of incineration to convert municipal solid waste (MSW) is a relatively old method of WtE generation. Incineration generally entails burning waste (residual MSW, commercial, industrial and RDF) to boil water which powers steam generators that generate electric energy and heat to be used in homes, businesses, institutions and industries. One problem associated is the potential for pollutants to enter the atmosphere with the flue gases from the boiler. These pollutants can be acidic and in the 1980s were reported to cause environmental degradation by turning rain into acid rain. Since then, the industry has removed this problem by the use of lime scrubbers and electro-static precipitators on smokestacks. By passing the smoke through the basic lime scrubbers, any acids that might be in the smoke are neutralized which prevents the acid from reaching the atmosphere and hurting the environment. Many other devices, such as fabric filters, reactors, and catalysts destroy or capture other regulated pollutants. According to the New York Times, modern incineration plants are so clean that "many times more dioxin is now released from home fireplaces and backyard barbecues than from incineration. " According to the German Environmental Ministry, "because of stringent regulations, waste incineration plants are no longer significant in terms of emissions of dioxins, dust, and heavy metals". During the 2001–2007 period, the waste-to-energy capacity increased by about four million metric tons per year. Japan and China each built several plants based on direct smelting or on fluidized bed combustion of solid waste. In China there are about 434 waste-to-energy plants in early 2016. Japan is the largest user in thermal treatment of municipal solid waste in the world, with 40 million tons. Some of the newest plants use stoker technology and others use the advanced oxygen enrichment technology. Several treatment plants exist worldwide using relatively novel processes such as direct smelting, the Ebara fluidization process and the Thermoselect JFE gasification and melting technology process. In India its first energy bio-science center was developed to reduce the country’s green house gases and its dependency on fossil fuel. As of June 2014, Indonesia had a total of 93.5 MW installed capacity of waste-to-energy, with a pipeline of projects in different preparation phases together amounting to another 373MW of capacity. Biofuel Energy Corporation of Denver, CO, opened two new biofuel plants in Wood River, Nebraska, and Fairmont, Minnesota, in July 2008. These plants use distillation to make ethanol for use in motor vehicles and other engines. Both plants are currently reported to be working at over 90% capacity. Fulcrum BioEnergy incorporated located in Pleasanton, California, is building a WtE plant near Reno, NV. The plant is scheduled to open in 2019 under the name of Sierra BioFuels plant. BioEnergy incorporated predicts that the plant will produce approximately 10.5 million gallons per year of ethanol from nearly 200,000 tons per year of MSW. Waste to energy technology includes fermentation, which can take biomass and create ethanol, using waste cellulosic or organic material. In the fermentation process, the sugar in the waste is changed to carbon dioxide and alcohol, in the same general process that is used to make wine. Normally fermentation occurs with no air present. Esterification can also be done using waste to energy technologies, and the result of this process is biodiesel. The cost effectiveness of esterification will depend on the feedstock being used, and all the other relevant factors such as transportation distance, amount of oil present in the feedstock, and others. Gasification and pyrolysis by now can reach gross thermal conversion efficiencies (fuel to gas) up to 75%, however a complete combustion is superior in terms of fuel conversion efficiency. Some pyrolysis processes need an outside heat source which may be supplied by the gasification process, making the combined process self-sustaining. 2 that would have been emitted by combustion. 2 emitted from their combustion will be taken out from the atmosphere once more. Such considerations are the main reason why several countries administrate WtE of the biomass part of waste as renewable energy. The rest—mainly plastics and other oil and gas derived products—is generally treated as non-renewables. MSW to a large extent is of biological origin (biogenic), e.g. paper, cardboard, wood, cloth, food scraps. Typically half of the energy content in MSW is from biogenic material. Consequently, this energy is often recognised as renewable energy according to the waste input. Several methods have been developed by the European CEN 343 working group to determine the biomass fraction of waste fuels, such as Refuse Derived Fuel/Solid Recovered Fuel. The initial two methods developed (CEN/TS 15440) were the manual sorting method and the selective dissolution method. A detailed systematic comparison of these two methods was published in 2010. Since each method suffered from limitations in properly characterizing the biomass fraction, two alternative methods have been developed. The first method uses the principles of radiocarbon dating. A technical review (CEN/TR 15591:2007) outlining the carbon 14 method was published in 2007. A technical standard of the carbon dating method (CEN/TS 15747:2008) will be published in 2008. [needs update] In the United States, there is already an equivalent carbon 14 method under the standard method ASTM D6866. The second method (so-called balance method) employs existing data on materials composition and operating conditions of the WtE plant and calculates the most probable result based on a mathematical-statistical model. Currently the balance method is installed at three Austrian and eight Danish incinerators. A comparison between both methods carried out at three full-scale incinerators in Switzerland showed that both methods came to the same results. Carbon 14 dating can determine with precision the biomass fraction of waste, and also determine the biomass calorific value. Determining the calorific value is important for green certificate programs such as the Renewable Obligation Certificate program in the United Kingdom. These programs award certificates based on the energy produced from biomass. Several research papers, including the one commissioned by the Renewable Energy Association in the UK, have been published that demonstrate how the carbon 14 result can be used to calculate the biomass calorific value. The UK gas and electricity markets authority, Ofgem, released a statement in 2011 accepting the use of Carbon 14 as a way to determine the biomass energy content of waste feedstock under their administration of the Renewables Obligation. Their Fuel Measurement and Sampling (FMS) questionnaire describes the information they look for when considering such proposals. According to the International Solid Waste Association (ISWA) there are 431 WtE plants in Europe (2005) and 89 in the United States (2004). The following are some examples of WtE plants. Edmonton Waste-to-ethanol Facility located in Edmonton, Alberta, Canada based on the Enerkem-process, fueled by RDF. Initially scheduled for completion during 2010 commissioning of front-end systems commenced in December 2013 and Enerkem then expected initial methanol production during 2014. Production start has been delayed several times. As of spring 2016 Enerkem expected ethanol production to commence some time ín 2017, and no public confirmation of any actual RDF processing was available. The US Air Force once tested a Transportable Plasma Waste to Energy System (TPWES) facility (PyroGenesis technology) at Hurlburt Field, Florida. The plant, which cost $7.4 million to construct, was closed and sold at a government liquidation auction in May 2013, less than three years after its commissioning. The opening bid was $25. The winning bid was sealed. Besides large plants, domestic waste-to-energy incinerators also exist. For example, the refuge de Sarenne has a domestic waste-to-energy plant. It is made by combining a wood-fired gasification boiler with a Stirling motor. Wikimedia Commons has media related to Waste-to-energy. ^ "NW BIORENEW". Archived from the original on 2011-07-14. Retrieved 2009-06-25. ^ Herbert, Lewis (2007). "Centenary History of Waste and Waste Managers in London and South East England" (PDF). Chartered Institution of Wastes Management. ^ "Energy Recovery - Basic Information". US EPA. ^ Lapčík; et al. (Dec 2012). "Možnosti Energetického Využití Komunálního Odpadu". GeoScience Engineering. ^ "Waste incineration". Europa. October 2011. ^ "DIRECTIVE 2000/76/EC OF THE EUROPEAN PARLIAMENT AND OF THE COUNCIL of 4 December 2000 on the incineration of waste". European Union. 4 December 2000. ^ a b c "Waste Gasification: Impacts on the Environment and Public Health" (PDF). ^ "Environment in the EU27 Landfill still accounted for nearly 40% of municipal waste treated in the EU27 in 2010". European Union. 27 March 2012. ^ "Waste–to–Energy in Austria, White Book, 2nd Edition 2010" (PDF). Austrian Ministry of Life. Archived from the original (PDF) on 2013-06-27. ^ Rosenthal, Elisabeth (12 April 2010). "Europe Finds Clean Energy in Trash, but U.S. Lags". The New York Times. ^ "Waste incineration – A potential danger? Bidding farewell to dioxin spouting" (PDF). Federal Ministry for Environment, Nature Conservation and Nuclear Safety. September 2005. ^ "Waste to energy in Indonesia". The Carbon Trust. June 2014. Retrieved 22 July 2014. ^ "Cost Effective Waste to Energy Technologies – Updated Article With Extra Information". bionomicfuel.com. Retrieved 28 February 2015. ^ "More recycling raises average energy content of waste used to generate electricity". U.S. Energy Information Administration. September 2012. ^ "Directive 2009/28/EC on the promotion of the use of energy from renewable sources". European Union. April 23, 2009. ^ A New Method to Determine the Ratio of Electricity Production from Fossil and Biogenic Sources in Waste-to-Energy Plants. by Fellner, J., Cencic, O. and Rechberger, H., 2007. In: Environmental Science & Technology, 41(7): 2579-2586. ^ Determination of biogenic and fossil CO2 emitted by waste incineration based on 14CO2 and mass balances. by Mohn, J., Szidat, S., Fellner, J., Rechberger, H., Quartier, R., Buchmann, B. and Emmenegger, L., 2008. In: Bioresource Technology, 99: 6471-6479. ^ "Fuelled stations and FMS" (PDF). ofgem.gov.uk. Retrieved 28 February 2015. ^ "Fuel Measurement and Sampling (FMS) Questionnaire: Carbon-14". ofgem.gov.uk. Retrieved 28 February 2015. ^ Energy-from-Waste facility in Lee County run as Covanta Lee, Inc.
^ "Enerkem to Squeeze Biofuel Out of Old Electricity Poles". gigaom.com. January 13, 2009. ^ Enerkem press release December 2013 found at the PR Newswire webpage. ^ "Enerkem Website". Enerkem. March 18, 2016. ^ "AFSOC makes 'green' history while investing in future". US Air Force Special Operations Command. Archived from the original on 2011-05-09. Retrieved 2011-04-28. .
^ "Pyrogenesis Perfecting Plasma". Biomass Magazine. ^ "PyroGenesis Plasma Gasification and Waste Incineration System". Government Liquidation. ^ "Autonomie énergétique pour un refuge de montagne : panneaux solaires". Connaissance des Énergies. 5 July 2012. Retrieved 28 February 2015. ^ "Waste Biomass Carbonization Plant - KG Biomass Plant". Field, Christopher B. "Emissions pathways, climate change, and impacts." PNAS 101.34 (2004): 12422–12427. Sudarsan, K. G., and Mary P. Anupama. "The Relevance of Biofuels." Current Science 90.6 (2006): 748. 18 Oct. 2009 <http://www.iisc.ernet.in/currsci/mar252006/748a.pdf>. Tilman, David. "Environmental, economic, and energetic costs." PNAS 103.30 (2006): 11206–11210.